Each student starts their school year in pretty much the same way – introducing themselves to their classmates and making new friends. Pen pals Ashley Huller, left, from Volney Elementary School and Meghan Galvin from Lanigan Elementary School play the game ‘Get-To-Know Me Tic-Tac-Toesy’ during a Pen Pal Picnic at Lanigan Elementary. The pair have been writing to one another all school year long as part of a cooperative pen pal project and finally got to meet for the very first time at a picnic at the end of the school year. 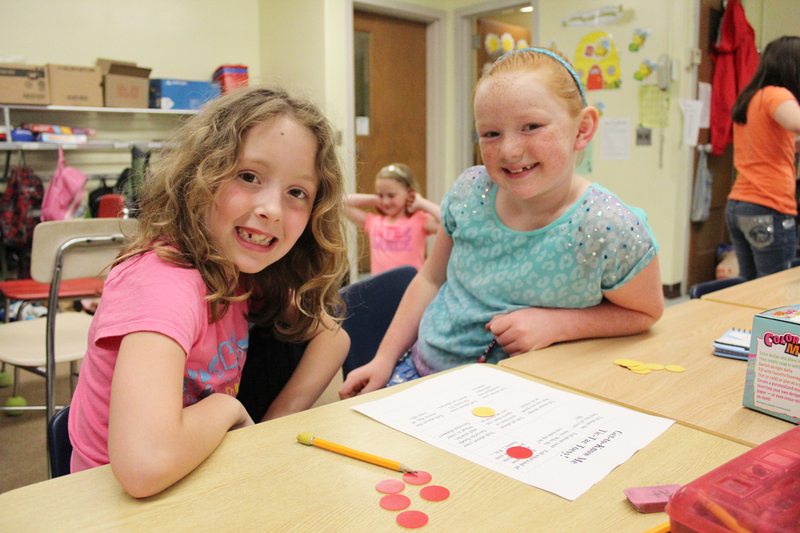 The same is true for the second grade students in Terry Merritt’s class at Lanigan Elementary School and Rauri Downes’ class at Volney Elementary School, but with a slight twist. A cooperative pen pal project coordinated by the two teachers gives each student an opportunity to also make a long-distance friendship with a fellow second grader a few miles down the road. Through the pen pal project the students write two letters a month all school year long, corresponding with one another about their school, their classes, their interests, their hobbies and much more. The teachers culminate the pen pal project with a picnic celebration at the end of the school year. 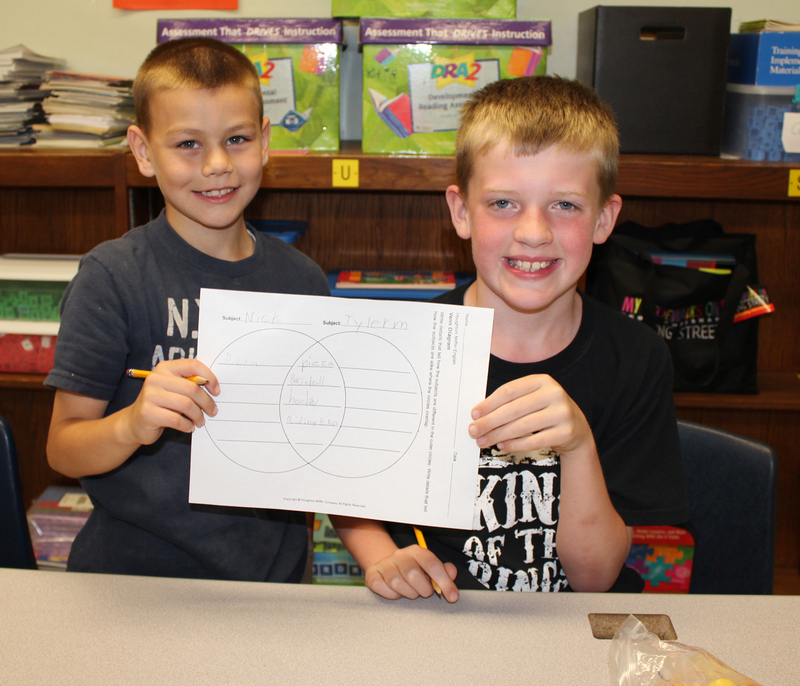 Pen pals Tyler Mills, left, from Lanigan Elementary School and Nick Shaw from Volney Elementary School find out how much they have in common by completing a Venn Diagram activity at a Pen Pal Picnic. Second grade teachers Terry Merritt, Lanigan, and Rauri Downes, Volney, have been coordinating a pen pal project for their students for more than the last 10 years. Students in each class write to one another all year long and then meet for the first time at a picnic at the end of the school year. This year’s picnic took place at Lanigan Elementary School and gave the pen pals an opportunity to meet one another face-to-face for the very first time. Ms. Merritt kicked off the picnic celebration by reading the ‘pals’ the book Stephanie’s Ponytail by Robert Munsch and then new ‘pals’ played games, enjoyed a pizza lunch and presented one another with a keepsake memento. The Pen Pal Project between Ms. Merritt and Mr. Downes is a more than 10-year tradition that serves to encourage students’ writing and social skills as well as reading comprehension skills.